Samuel Joseph Grant gazed down from his hotel room at the side street below in 1894 Leeds. He wouldn’t be born for a few months, but the strange device he’d found at that bombed out château near Amiens was a remarkable gift. 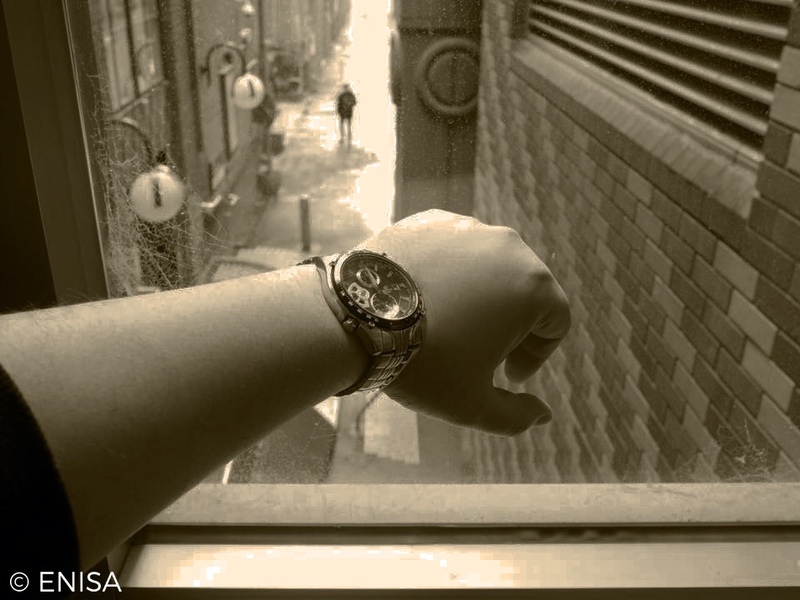 It was immediately obvious that it was a timepiece meant to be worn on the arm, but what he hadn’t realized at first was that the term “timepiece” had more than one meaning. Sadly, he discovered its former owner with half his head missing, most likely the unfortunate result of a slight miscalculation. Had he materialized a few seconds later, he would have not been victimized by the German cannon bombardment. However, his anonymous benefactor’s ill-luck became Grant’s good fortune. That day had marked the end of his career as a corporeal in the British Army, and the beginning of his adventures as a time bandit. With all of history to choose from which to derive wealth, where, when, and what should he sample first? Extending his arm, he prepared to set the controls. I wrote this for the 166th FFfAW Writing Challenge hosted by Priceless Joy. As always, the idea is to use the image above as the inspiration for crafting a piece of flash fiction between 100 and 175 words long. My word count is 175. The photo struck me as combining both the new and the old, so that could only mean time travel. Not a lot of research went into this one. I pretty much went with my gut. If you were so inclined, where and when in history would you choose to rob? This is wonderfully thought out and narrated. Fabulous. Thanks, yarnspinnerr. It just sort of wrote itself. A story right down your alley James 🙂 Plenty of times and places I would visit, not sure I would use it to go looking for wealth, that’s bound to end in trouble. You might not, Iain, but I can imagine plenty of people who would. Thanks. This could be the start of yet another series, James. If I ever got a time machine, I’d like to go visit the construction of pyramids. Would love to know how they hauled those huge stone blocks into position. I’ve got so many time travel stories now that could be developed into series, my head is spinning. This is a one off from my point of view. In real life, time travel would be a more difficult thing, especially if you intended to blend in. Just think of all the languages, dialects, cultural norms, and such you’d have to master, even to go back in time a few hundred years. Great time travel story James! James, you are such a good writer. Wouldn’t it be such a cool thing to do? But I’ll play along in a different way. I would try to find extinct or endangered plant life, especially fruit-producing vegetation. I’d take a little bit (not rob) in a “sustainable” way. But then that brings up the “ethics” of science fiction. One is not supposed to change history, right? Would that be thrilling enough for people who enjoy breaking rules? At least conceptually, yes. I think I mentioned in another comment that if we travelled even a few centuries into the past, and maybe a little as a few decades, we’d stick out like sore thumbs unless we were intimately familiar with the language, social norms, and cultural references…even in our own countries. Both pretty dangerous ambitions I fear. Thanks. I have to agree, I think… I’d like to see dragons if they really existed… as simply animals. I liked this, and didn’t find it overly predictable. After all, time travel is only predictable for the time traveler. Oh, there are plenty of well worn time travel tropes, including the one I employed. Of course, in an expanded version, who is to say that someone might come along to take the watch back. Interesting take on the prompt…I liked it! Your gut worked well for you on this one James. Thoroughly enjoyable story.